Apple! Apple! Apple! Yesterday, you were probably too busy gawking at Cupertino's precious new watch and giant smartphones to notice anything else that happened in the world of technology. There's no shame in that. But if you were paying attention to the 2014 Intel Developers Conference in San Francisco, you might have gotten a glimpse of a pretty intriguing tablet. Michael Dell himself walked out on stage to announce the device. Second, this slate also comes with arguably the world's best tablet screen: a gorgeous 8.4-inch, 2560 x 1600 OLED panel with colors to die for. It's a Samsung panel, which shouldn't be too surprising: it looks like a dead ringer for the identically-specced display that blew our socks away in our Samsung Galaxy Tab S review. Only here, the tablet is even thinner and the glass stretches from edge to edge. There's practically no bezel to block your view. Instead, there's a single grip on the left which houses speakers and two of the tablet's FOUR cameras. What could Dell possibly need with four cameras? I'm glad you asked: in addition to its other achievements, the new Dell slate is the very first Intel RealSense tablet. It's no secret that Intel has been working on miniaturizing 3D cameras for some time now, originally with the intent to turn every laptop into a Kinect. You know, control your programs with a wave of the hand. But in this tablet, that depth-sensing RealSense module isn't facing you: it's next to another rear-mounted 8 megapixel camera that you'll take your pictures with. Instead of letting you re-enact Minority Report, the extra cameras give the tablet an understanding of how far away the objects are in your photographs and allow you to manipulate them accordingly. For instance, you can tap on a point in the picture to refocus the entire image, Lytro-style, or pretend your camera lens has a different aperture after the fact (see GIF below). In our hands-on with a prototype unit, the depth-sensing wasn't perfect and the Dell software to manipulate those images was quite buggy, but I saw enough examples to be convinced the technology really works. At one point, a rep converted an entire picture from color to black and white, and back again, starting with the objects closest to the camera and progressively moving further away, so clearly it knew how far those objects were. Another example saw snowflakes drifting down onto a bicycle, and landing only on the top surfaces of objects in the photo. Unfortunately, the world's most interesting tablet also has the world's most boring name: the Dell Venue 8 7000 Series, or Dell Venue 8 7840 if you want to be specific. Just rolls right off the tongue. Seriously, folks, you might want to call it something a teensy little bit edgier if you want to get noticed. Here's a freebie: call it the Dell Scimitar. 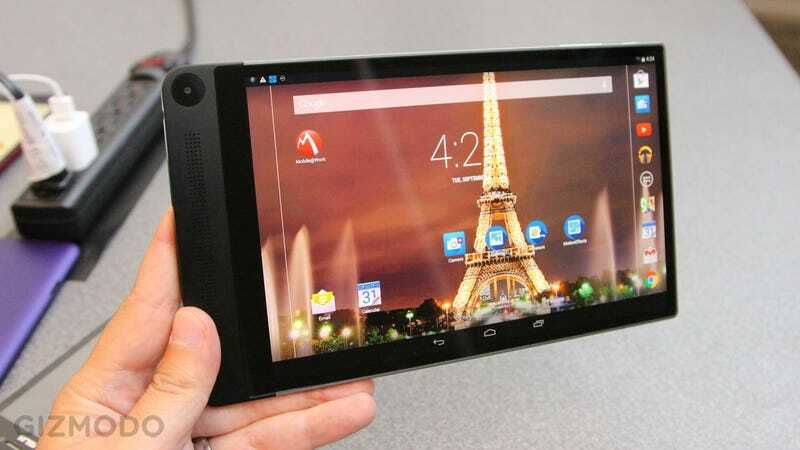 We're not sure how much the Dell Venue 8 7840 (ugh) will cost or how long it will last on a charge, but it runs Android 4.4 on a quad-core 2.33GHz Intel Atom Z3580 processor, has Wi-Fi connectivity and 32GB of storage (reportedly expandable via microSD card), charges over microUSB, and should be available this holiday season in the United States and other countries. It also won't be a one-off as far as the RealSense camera is concerned: at an estimated cost of $10-20 for the depth camera module, Intel's partners plan to integrate it into another device with LTE, and a third one with a larger screen and a keyboard.